The area near the surface of the earth can be divided into four interconnected spheres: lithosphere, hydrosphere, biosphere, and atmosphere. Think of them as four interconnected parts that make up a complete system, in this case, of life on earth. Environmental scientists use this system to classify and study the organic and inorganic materials found on the planet. The names of the four spheres are derived from the Greek words for stone (litho), air or vapor (atmo), water (hydro), and life (bio). The lithosphere, sometimes called the geosphere, refers to all of the rocks of the earth. It includes the planet's mantle and crust, the two outermost layers. The boulders of Mount Everest, the sand of Miami Beach and the lava erupting from Hawaii's Mount Kilauea are all components of the lithosphere. The actual thickness of the lithosphere varies considerably and can range from roughly 40 km to 280 km. The lithosphere ends at the point when the minerals in the earth's crust begin to demonstrate viscous and fluid behaviors. The exact depth at which this happens depends on the chemical composition of the earth, and the heat and pressure acting upon the material. The lithosphere is divided into 15 tectonic plates that fit together around the earth like a jagged puzzle: African, Antarctic, Arabian, Australian, Caribbean, Cocos, Eurasian, Indian, Juan de Fuca, Nazca, North American, Pacific, Philippine, Scotia and South American. These plates aren't fixed; they're slowly moving. The friction created when these tectonic plates push against one another causes earthquakes, volcanoes and the formation of mountains and ocean trenches. The hydrosphere is composed of all of the water on or near the planet's surface. This includes oceans, rivers, and lakes, as well as underground aquifers and the moisture in the atmosphere. Scientists estimate the total amount at more than 1,300 million cubic feet. More than 97 percent of the earth's water is found in its oceans. The remainder is fresh water, two-thirds of which is frozen within the earth's polar regions and mountain snowpacks. It's interesting to note that even though water covers the majority of the planet's surface, water accounts for a mere 0.023 percent of the earth's total mass. The planet's water doesn't exist in a static environment, it changes form as it moves through the hydrological cycle. It falls to the earth in the form of rain, seeps into underground aquifers, rises to the surface from springs or seeps from porous rock, and flows from small streams into larger rivers that empty into lakes, seas, and oceans, where some of it evaporates into the atmosphere to begin the cycle anew. The biosphere is composed of all living organisms: plants, animals and one-celled organisms alike. Most of the planet's terrestrial life is found in a zone that stretches from 3 meters below ground to 30 meters above it. In the oceans and seas, most aquatic life inhabits a zone that stretches from the surface to about 200 meters below. But some creatures can live far outside of these ranges: some birds are known to fly as high as 8 kilometers above the earth, while some fish have been found as deep as 8 kilometers beneath the ocean surface. Microorganisms are known to survive well beyond even these ranges. 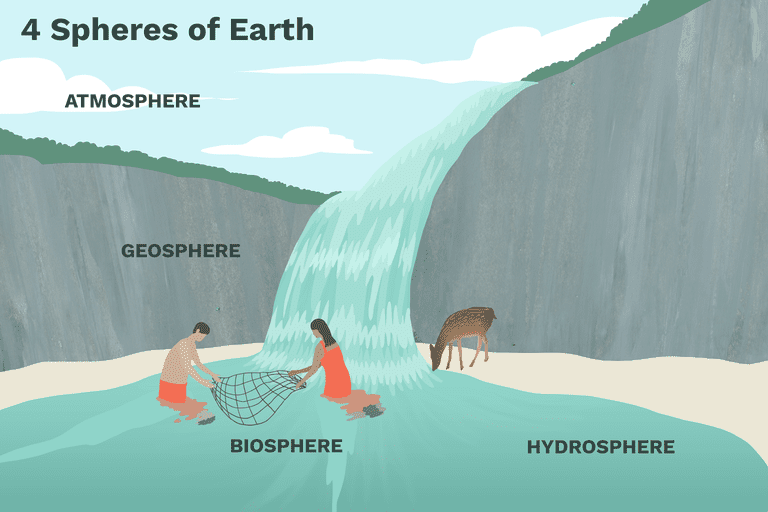 The biosphere is made up of biomes, which are areas where plants and animals of a similar nature can be found together. A desert, with its cactus, sand, and lizards, is one example of a biome. A coral reef is another. The atmosphere is the body of gasses that surrounds our planet, held in place by earth's gravity. Most of our atmosphere is located close to the earth's surface where it is most dense. The air of our planet is 79 percent nitrogen and just under 21 percent oxygen; the small amount remaining is composed of argon, carbon dioxide, and other trace gasses. The atmosphere itself rises to about 10,000 km in height and is divided into four zones. The troposphere, where about three-quarters of all atmospheric mass can be found, stretches from about 6 km above the earth's surface to 20 km. Beyond this lies the stratosphere, which rises to 50 km above the planet. Next comes the mesosphere, which extends to about 85 km above earth's surface. The thermosphere rises to about 690 km above the earth, then finally the exosphere. Beyond the exosphere lies outer space. All four spheres can be and often are present in a single location. For example, a piece of soil will contain minerals from the lithosphere. Additionally, there will be elements of the hydrosphere present as moisture within the soil, the biosphere as insects and plants, and even the atmosphere as pockets of air between soil pieces. The complete system is what makes up life as we know it on Earth.